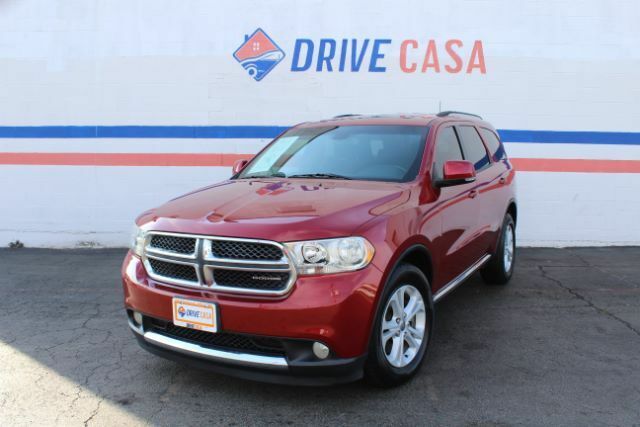 When it comes to SUVs, our 2011 Dodge Durango Crew AWD is among the best in its class! Powered by a 3.6 Liter V6 connected to a smooth shifting 5 Speed Automatic transmission offering near 22mpg on the open road. Be it the quiet ride, easy handling, nice interior, comfort or sophisticated technology, this Durango offers it all in one. Once inside this spacious Durango Crew, you will be greeted with a plush cloth interior, push-button start, a premium sound system with available satellite, multifunctional leather-wrapped steering wheel, back up camera, DVD system, 3rd-row seating, and so much more. Dodge offers plenty of safety features embedded in its DNA to impress you that starts with a solid build and adds ABS and airbags! With our Durango Crew, you''ll be set in every way! Print this page and call us Now... We Know You Will Enjoy Your Test Drive Towards Ownership! Here at Drive Casa we pride ourselves on customer service and quality vehicles. As one of the premier Buy Here Pay Here dealers in Texas, we are passionate about helping people with poor credit or no credit at all get financed through our in-house program. Every vehicle comes with a 12 month/12,000 mile limited warranty. To top that, oil changes are on us for the first year of ownership! Stop by or call us today! We are here for you! Aqui en Drive Casa nos enorgullecemos de servicio al cliente y vehiculos de calidad. Como uno de los distribuidores principals de Buy Here Pay Here en Texas, nos apasiona ayudar a las personas con mal credito en lo absoluto o ser financiados a traves de nuestro programa interno. Cada vehiculo viene con una grantia limitada de 12 meses / 12,000 millas. Por encima de eso, los cambios de aceite estan a nuestro costo el primer ano de propiedad! Venga o llamenos hoy mismo! Estamos aqui para ti!